After a successful test flight to the Kahama airstrip in Shinyanga region on Monday, July 17, Precision Air says they plan to add the route to their destinations. 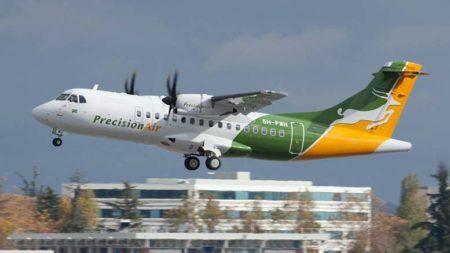 Precision Air will start its operations effective from September 5, 2017, starting with three flights a week, every Wednesday, Friday and Sunday, says Precision Air’s corporate affairs manager Hillary Mremi. “There will be no need for passengers from Shinyanga and Kahama to drive all the way to Mwanza to catch their flight to Dar es Salaam,” says Mremi. The Kahama airstrip now also carries the IATA code KBH. 1 Comment on "Successful test flight to Kahama"
Thank you the management of precionair for providing this service for Kahama people.